Lately, I've been playing around with my new camera trying to get some interesting shots of even more interesting plants. I've had difficulties getting the focus just right and sometimes the sun isn't in my favor, but the following photos turned out pretty good and are fine examples of some very unique plant species. I wish I knew the names of these plants, but I'll have to ask Steve. You might be able to click on the photos for larger versions if you're interested. Actually, comment if you try it and it lets you. Thanks and enjoy! 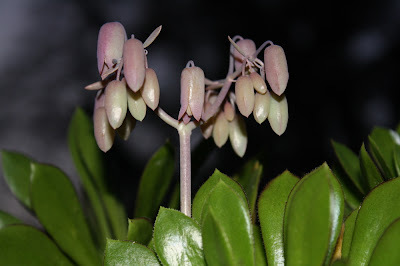 Taken from our patio - a bloom coming up out of a shiny succulent plant. To me, it kind of looks like a little flower child with multiple buds as hands, yearning for a hug. 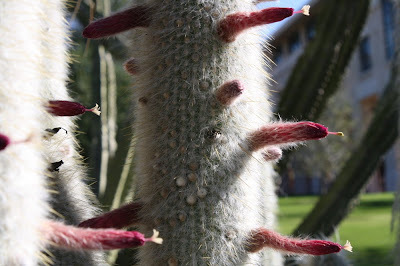 Taken at Cal Poly in the cactus garden near the Education Building - This is possibly the strangest cactus I have ever seen, and it gives me the heebie-jeebies.